“Beware the beast Man, for he is the Devil’s pawn. Alone among God’s primates, he kills for sport or lust or greed. Yea, he will murder his brother to possess his brother’s land. Let him not breed in great numbers, for he will make a desert of his home and yours. Shun him; drive him back into his jungle lair, for he is the harbinger of death”. 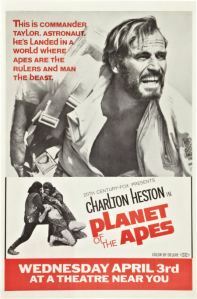 Classic sci-fi movie about an astronaut crew that lands on a distant planet where apes are masters and humans their slaves. Fascinating subject, unforgettable sets and an ending that will leave you speechless. So well done, it inspired 4 sequels, and a sloppy remake in 2001.